Robots are pervading human society today at an ever-accelerating rate, but in order to actualize their profound potential impact, robots will need cognitive capabilities that support the necessary social intelligence required to fluently engage with people and other robots. People are social agents and robots must develop sufficient social intelligence to engage with them effectively. Despite their enormous potential, robots will not be accepted in society unless they exhibit social intelligence skills. They cannot work with people effectively if they ignore the limitations, needs, expectations and vulnerability of people working in and around their workspaces. People are limited social agents, i.e. they do not have unlimited cognitive, computational and physical capabilities. People have limited ability in perceiving, paying attention, reacting to stimuli, anticipating, and problem-solving. In addition, people are constrained by their morphology; it limits their physical strength for example. People cannot be expected to and will not compensate for social deficiencies of robots, hence widespread acceptance and integration of robots into society will only be achieved if robots possess the sufficient social intelligence to communicate, interact and collaborate with people. In this paper we identify the key cognitive capabilities robots will require to achieve appropriate levels of social intelligence for safe and effective engagement with people. 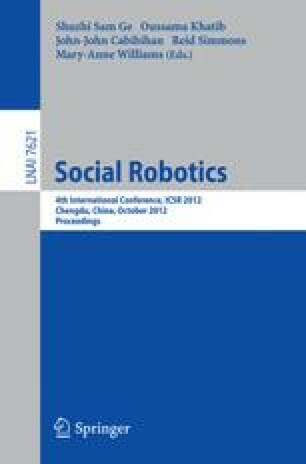 This work serves as a proto-blueprint that can inform the emerging roadmap and research agenda for the new exciting and challenging field of social robotics.